Mizzou has made its mark on Nikolaus Frier, a senior mechanical engineering major from St. Louis, and he will leave his mark on Mizzou as well. For his field of study, Nik had a couple of in-state options but chose Mizzou, which he says “seemed beautiful and big” and where he knew he’d have many options for getting involved. Extracurricular activities have in fact brought Nik unanticipated opportunities. 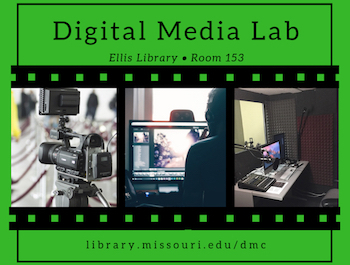 He was a member of the 3D Printing Club during the time when the service was transitioning from being student led to being hosted by Mizzou Libraries. “I was losing hours at another campus job,” he said, “so I sent out my feelers and asked if the library would need any additional help running this service.” After demonstrating his knowledge of 3D printing to Ernest Shaw, Manager of Information Technology for the Libraries, Nik found himself employed by Print Anything. Nik worries that his favorite Mizzou memory “might be a little cheesy,” but going to the midnight barbeque the first week of his freshman year was life changing. He met his girlfriend there, and they celebrated four years together in August. His second favorite memory is yet to come. 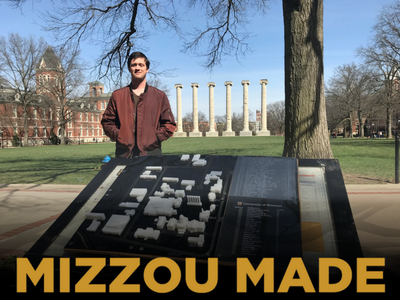 As project lead for Make Mizzou, a project of the 3D Printing Club, he’s overseen the design of a 3D campus map for the quad. “We have the 2D kiosks around campus, right?” Nik asks. “We wanted a 3D one so visually impaired students would be better able to navigate campus.” The 3D campus map is currently in the prototype finalization stage and will be installed in the fall. “Getting involved is the right step into learning about your resources here at Mizzou,” Nik advises his fellow Tigers. “As soon as you’re part of a club, you realize you need this thing done. Well, how would I get that done? Then you start asking the right questions.” Nik is proof that asking the right questions pays off. Nik plans to work as an engineer after graduation but also is confident that he has learned the necessary skills to open his own model-making company. Either way, he won’t miss what he foresees as his second favorite Mizzou memory: the groundbreaking of the 3D campus map in the fall.